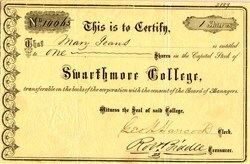 Beautiful certificate for one share from the Swarthmore College issued prior to 1895. This item has been hand signed by the Company’s Clerk, George W. Hancock and Treasurer, Robert Biddle, and is over 116 years old. George W. Hancock, Died March 22, 1903, Merion, Pa. Clerk of Corporation, 1878-1894. Swarthmore College is a private, independent, liberal arts college in the United States with an enrollment of about 1,500 students. The college is located in the borough of Swarthmore, Pennsylvania, 11 miles (17.7 km) southwest of Philadelphia. The school was founded in 1864 by a committee of Quakers, including Lucretia Mott, who were members of Philadelphia Yearly Meeting, Baltimore Yearly Meeting and New York Yearly Meeting of the Religious Society of Friends. Swarthmore dropped its religious affiliation and became officially non-sectarian in the early 20th century. The college has been coeducational since its founding. Swarthmore is a member of the Tri-College Consortium, a cooperative arrangement among Swarthmore College, Bryn Mawr College, and Haverford College. The consortium shares an integrated library system of more than three million volumes, and students are able to cross-register in courses at all three institutions. A common Quaker heritage amongst the consortium schools and the University of Pennsylvania also extends this cross-registration agreement to classes at Penn's College of Arts and Sciences. Swarthmore's campus and the Scott Arboretum are coterminous—that is, they are coextensive in land, sharing the same borders. The name "Swarthmore" has its roots in early Quaker history. In England, Swarthmoor Hall in Cumbria was the home of Thomas and Margaret Fell in 1652 when George Fox, fresh from his epiphany atop Pendle Hill in 1651, came to visit. The visitation turned into a long association as Fox persuaded Thomas and Margaret Fell and the inhabitants of the nearby village of Fenmore of Friendly, and Swarthmoor was used for the first Friends' meetings. The school was founded in 1864 by a committee of Quakers who were members of Philadelphia Yearly Meeting, New York Yearly Meeting and Baltimore Yearly Meeting of the Religious Society of Friends. Edward Parrish was its first president. Lucretia Mott was among those who insisted that Swarthmore be coeducational. Solomon Asch and Wolfgang Köhler were two noted psychologists who were professors at Swarthmore. Asch joined the faculty in 1947 and served until 1966, while Köhler came to Swarthmore in 1935 and served until his retirement in 1958. The Asch conformity experiments took place at Swarthmore. History from StockResearch.pro (Professional Old Stock Certificate Research Service), Encyberpedia and Wikipedia.